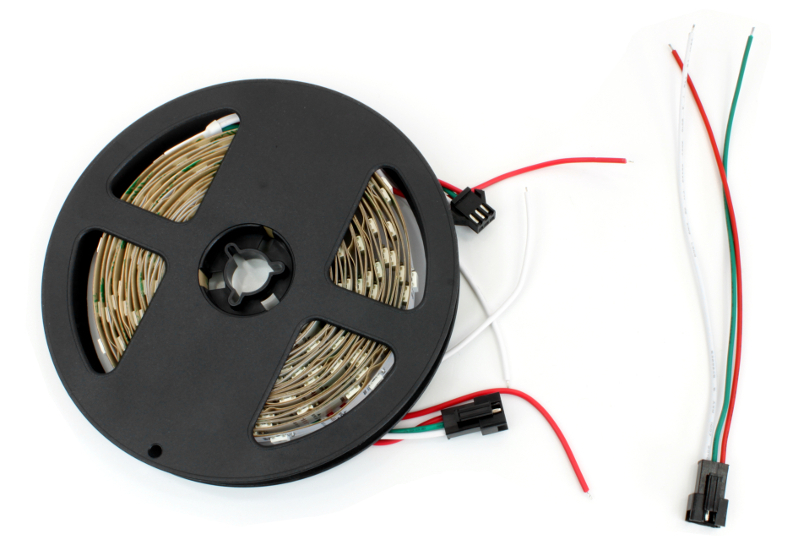 As of today we have new WS2812B LED strips in our shop. You can now buy 5m strips for 59.99€ (incl. VAT). The old WS2801 LED strips had a price of 99.99€! The strips have 30 RGB-LEDs per meter (previously 32 LEDs). The controlling IC (WS2812B, sometimes called “NeoPixel”) has the LEDs directly integrated. The strips can be controlled by the LED Strip Bricklet. You only have to connect 5V, ground and one data line. The strips with WS2812B are cheaper to acquire for us and we are of course sharing the price advantage with you! We will only offer full reals of length 5m with the new strip type. The effort to create strips with custom length does not make a lot of sense anymore with the new retail price.